Eric Robson hosts the horticultural panel programme from The Charterhouse in London. Pippa Greenwood, Matthew Pottage and Matthew Wilson answer the questions. This week, the panellists debate whether or not to leave daffodils to die back naturally, if mistletoe affects the taste of your apples, and how to move a large Japanese Maple that has outgrown its pot. They also suggest plants for a hedge in a city garden, what to plant for immediate effect in a wildflower meadow, and the plants they would like to obliterate from horticulture. 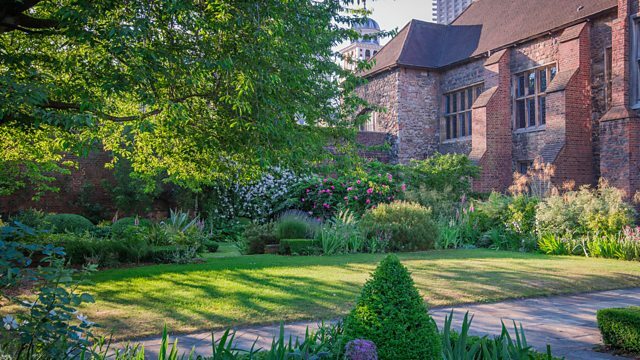 Away from the questions, Matthew Wilson takes a tour of the gardens hidden away within The Charterhouse, deep within the City of London. Q – Should we leave daffodil foliage to die back before mowing or can we mow after flowering has finished? Wilson – I would leave it. I’d even plant more bulbs that will come through later like Camassias. Deadhead and then let them die back naturally. Pottage – Use cultivars like ‘Jenny’ or ‘Thalia’; ones that have smaller narrower leaves so it’s easier to manage. Then other things – orchids, yellow rattle – can move in and add a new aesthetic. Q – Does mistletoe on an apple tree affect the quality of the apples? Q – Do you have any suggestions for a hedge to divide my lawn and patio? It needs to be hardy and clay-tolerant. Wilson – Hawthorn used to be popular but it won’t work in a short run. Camellia works well in London. Go for a white-flowered variety as they look neater in a hedge. Pippa – If you can go up to 4ft to 5ft (1.2m to 1.5m) I would choose Beech. Run a Clematis through it. Q – I have a ‘Japanese Maple’ (Acer palmatum ‘Dissectum’) in a terracotta pot but the tree’s root has grown through the pot into the ground. Is it safe to cut the root or should I break the pot and dig the whole thing up? Pottage – I would break the pot and dig it out. You don’t want to upset the tree. Q – We planted a wildflower meadow in 2017 but it is taking its time to establish. What single plant would you recommend that would quickly establish itself in this London location? Wilson – Yellow rattle. It is a hemi-parasitic plant that reduces the vigour of the grass around it and so helps other flowers to establish. Heavily scarify in autumn and then sow it in. Pottage – You’ve got a perfect spot for exotics. Abandon the meadow and do exotics instead. Q – I was given a lemon tree as a present. If it flowers before it can go outside, how do I pollinate it? Pippa – You could titivate with a paintbrush, but I think there are enough accidental pollinators around that you should be ok without bees etc. Q – What should I plant to screen a new deer/rabbit fence? It’s about 6ft (1.8m) tall. Wilson – Look at native hedgerows around where you live and plant along those lines. Go down the thornier route like Hawthorn. Q – We have planters on our doorstep that have been there for two years. Should I now empty and start again? Or keep the current plants? They’re starting to look a little tired. Pottage – Get rid and start again. Use a John Innes No 3 to give the next lot of plants a longer life in a smaller pot. Wilson – After doing that regularly liquid feed and that will help longevity too. Q – If you could obliterate any plant from horticulture what would it be and why? Pippa – Fake grass. Or Viburnum tinus – it smells like wet dog.